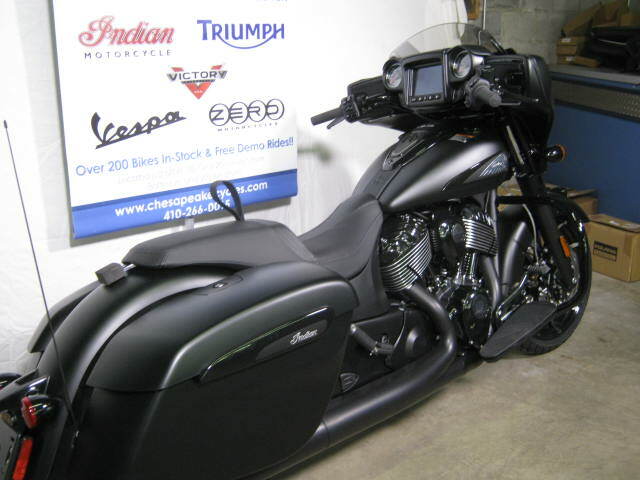 THE ALL-NEW, 2019 CHIEFTAIN DARKHORSE IS NOW IN-STOCK AND COOLER THAN EVER! FOR 2019 INDIAN TOOK ONE OF ITS MOST POPULAR BIKES AND IMPROVED IT ONCE AGAIN. NOW WITH AN UPGRADED STEREO (100 PREMIUM WATTS), SWITCHABLE RIDE MODES TO IMPROVE PERFORMANCE IN ALL RIDING SITUATIONS, AND WITH REAR-CYLINDER DEACTIVATION TO IMPROVE MILEAGE AND LOWER OPERATING TEMPS WHEN STOPPED AT IDLE! ADD THAT A REDESIGNED FRONT FAIRING, LOWER SEAT HEIGHT, AND LARGER ELECTRONIC-LOCKING BAGS AND THE BEST JUST GOT ALL THAT MUCH BETTER! Like it’s predecessors, the 2019 Indian Chieftain Dark Horse is all about the ride. From the incredible power of the ThunderStroke 111 to the electronic windscreen and air-ride suspension this bagger is as much about the ride as it is about looks. Although it is still arguably one of the best looking machines ever built on two-wheels. ABS and cruise control are stock, as is tire pressure monitoring, Bluetooth, and keyless remote ignition and bag lock system. To call it the perfect bagger might be pushing it, then again we know nothing else in category even comes close! Come check it out today and then set the navigation on a course for the perfect getaway location. Just fire it up and say “goodbye suckers” to your office mates. If you want the “best of the best,” the Chieftain Darkhorse fits that bill in every way imaginable!